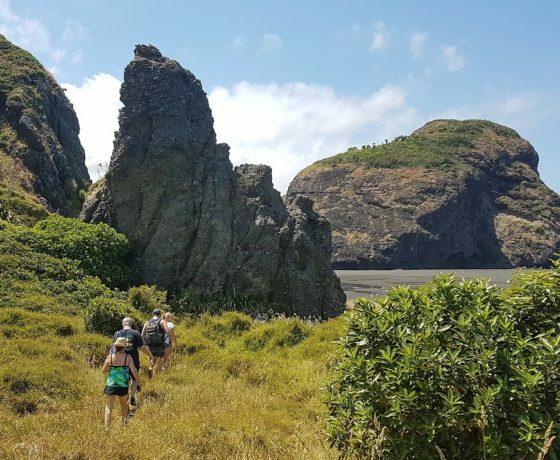 Black Sands Tours is a small group day tour of adventure showing you what Auckland’s wild west coast has to offer. 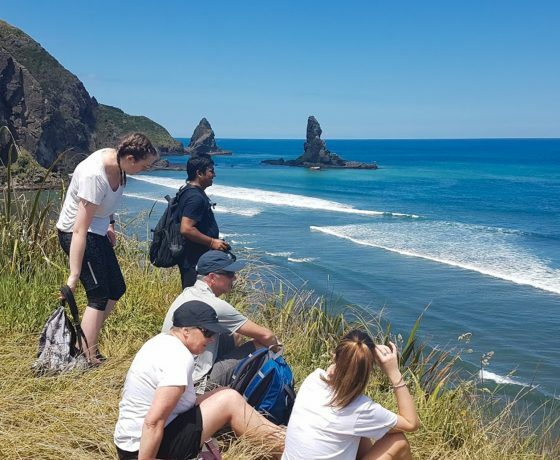 and one of the very best rated tours to experience Piha Beach, Muriwai, Whatipu, Bethells Beach and Kitekite Falls. 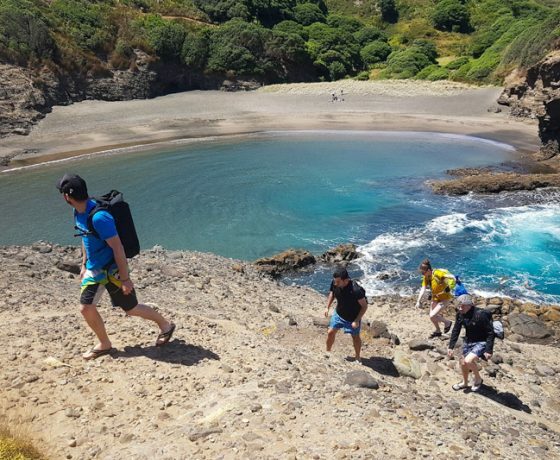 This exciting guided day trip will take you off the beaten track, where nobody else goes, and is the perfect tour if you want to spend the day swimming in waterfalls, river crossings, surf beaches, lakes, lagoons, caves, hiking and lots of rock scrambling, and sand dune running. A moderate level of fitness and an appetite for adventure is a must. Then this is the tour for you!. We depart Auckland daily at approx 10 am on this six-hour adventure tour (10:00am – 4:00pm) as we head out to the the beautiful West coast to experience bush, beach, waterfalls, caves and lakes, there will be a brief pit-stop on the way to the wild west coast allowing you to purchase any essentials (sunscreen, sandwiches or water, morning coffee) before we head to the chosen locations for the day. that is customised and varies daily to suit the capabilities and interests of the group along with weather conditions on the day. So expect an intimate experience and some new friends by the end of the day! We also specialise in private tours taking you, your friends and family on an experience you won’t forget. With a private tour we can work with you to create an itinerary to fit in what you want to see and do. He will also keep you safe as you enjoy your day’s West Coast adventure with us. So what are you waiting for? 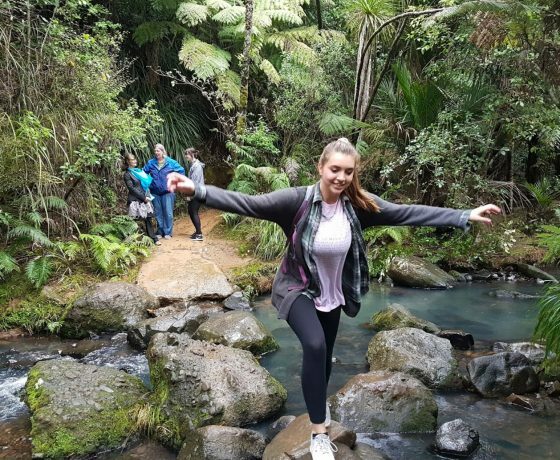 Book your authentic kiwi adventure today! Below are some of our favorite locations. 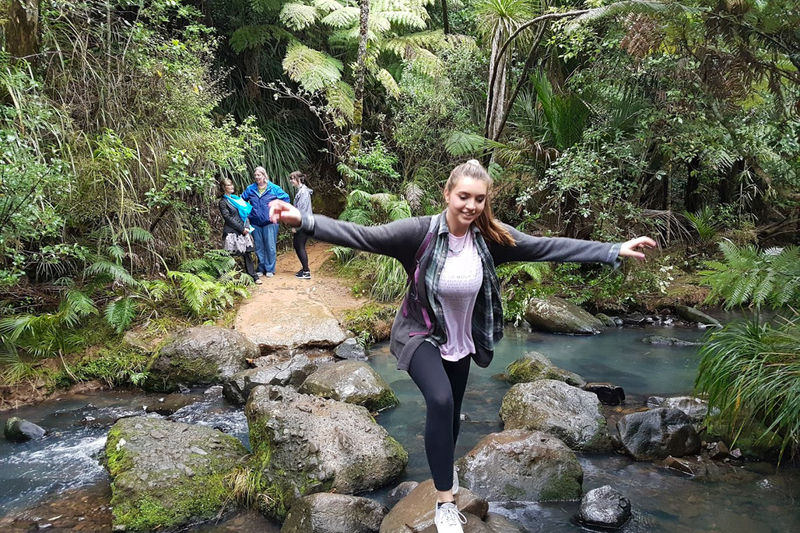 We do other locations including more Black Sand Beaches, Waterfalls and the like, all over the Waitakere ranges. If you have a spot not listed below that you really want see, don’t panic just ask us. Every Black Sand tour includes (2) of the locations below. Group’s preferences are a major factor in determining our route for the day. 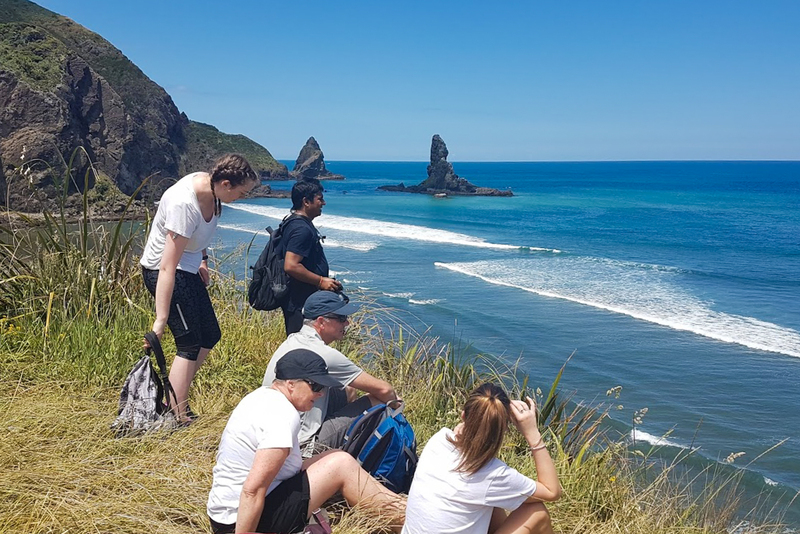 Black Sand Tours & Adventures are designed to make you feel like a local Kiwi enjoying these locations with old friends…. 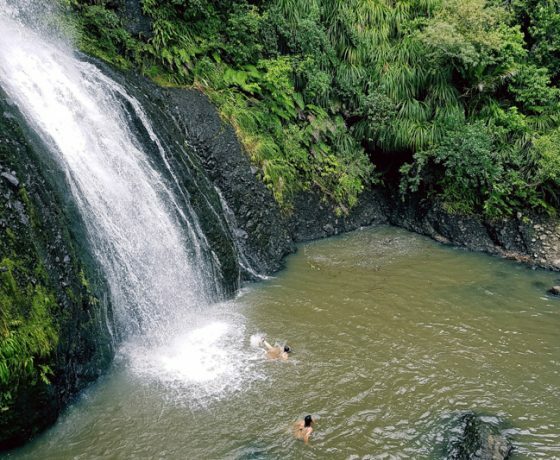 Kitekite falls is a beautiful 140 foot high, three level waterfall in Auckland’s Waitakere Ranges. 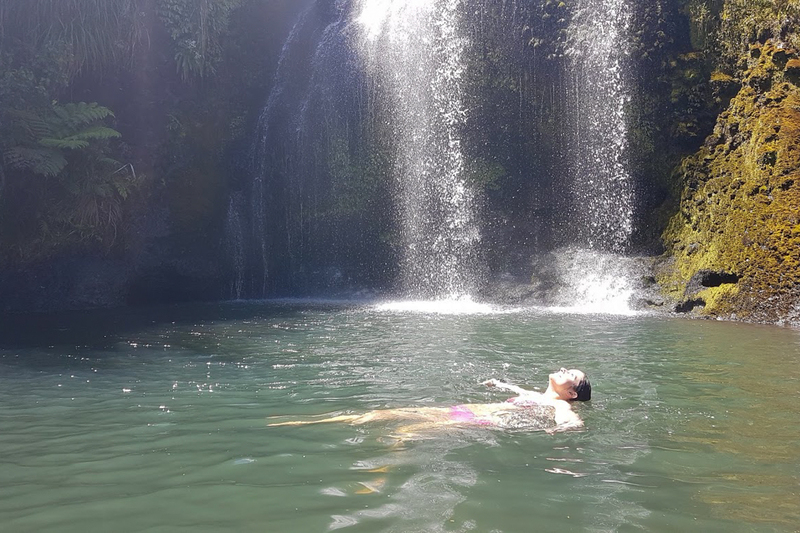 Black Sand Tours takes you on a 30-minute easy grade hike, exploring native plants, birds and ferns, finishing at the spectacular waterfall where you can have a refreshing swim, if you like. 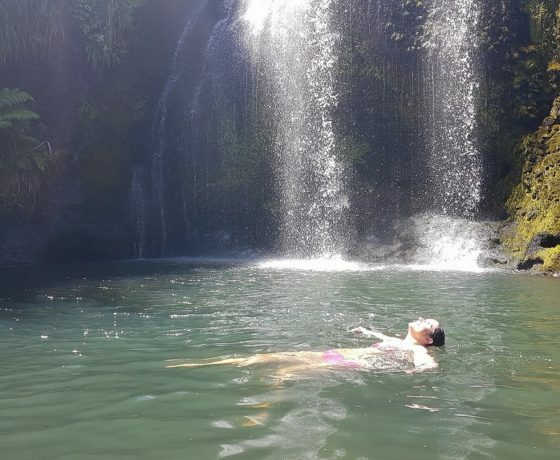 We’ll even take you swimming underneath the waterfall. 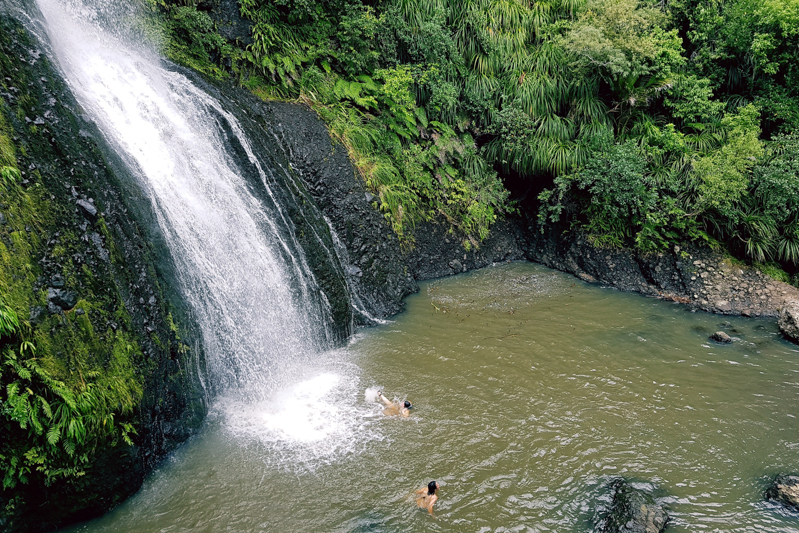 For the adventurous amongst you, we will take you on a further epic hike to the mid-section of the waterfall which is much more secluded. 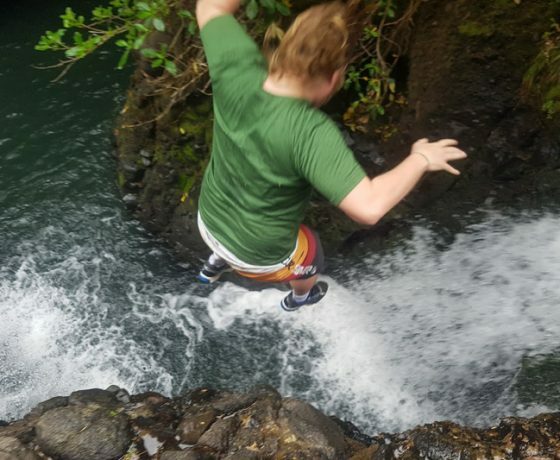 Or to the top section where you can leap off the rocks into the quiet pools above. Then we will finish with a nice 30-minute rain forest stroll out. 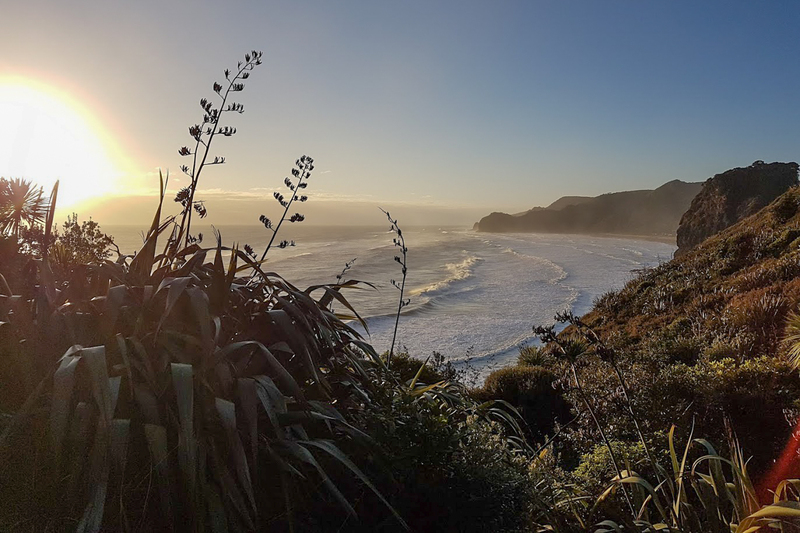 A favorite amongst locals, of the BlackSand beaches, a day at Anawhata is always an adventure. It may be the most empty, perfect, untouched beach in the entire world. 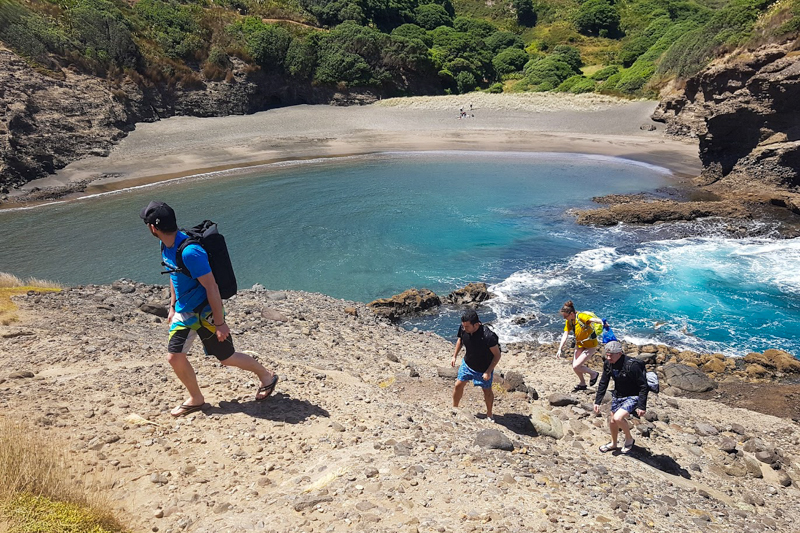 Black sand (of course), decent surf, the monolithic Keyhole rock, amazing quiet lagoons and rock pools, fun low-level cliff jumps, beautiful sand dunes for running / rolling / sliding down, and a quiet, safe river for a lazy swim. Activities at Anawhata will vary according to conditions on the day. We have to keep you all safe! Even if we did none of those activities, it is maybe the most beautiful empty place in the world. Seldom more than 20 people there. Piha is a staple of our tour. 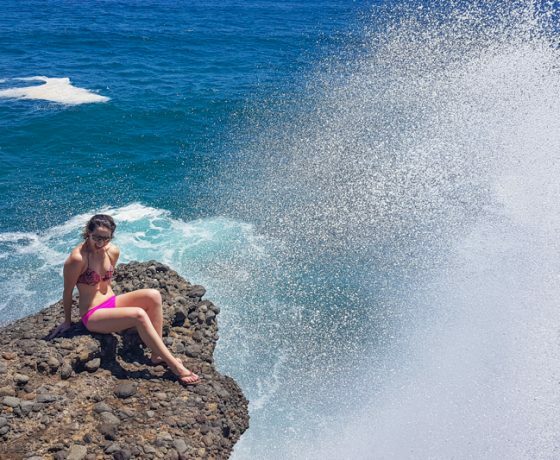 It is a spectacular, popular Black Sand surf beach. 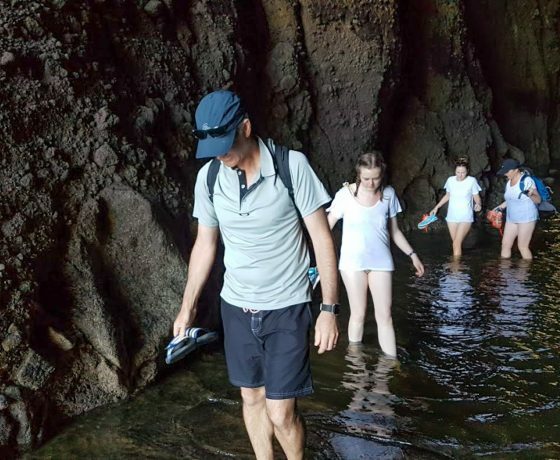 Activities are tailored to suit the group’s desire, but include hikes, cave exploration, lagoon swimming, cave swimming (dependant on conditions), cliff diving (depending on conditions), sunbathing, rock scrambling, amazing photography opportunities and lots of tidal pool exploration and relaxation. 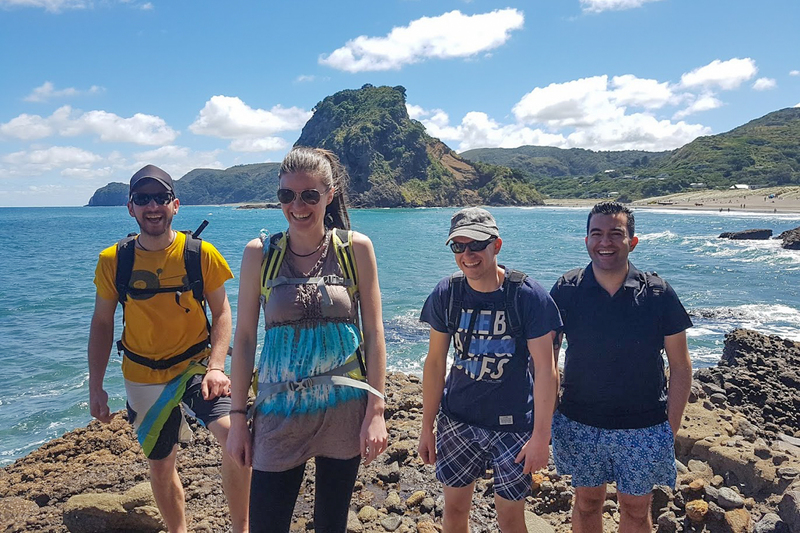 Piha can be as chilled and relaxed or as epic and adventurous as the group wants it to be making it a very fun place to spend some time. One thing is for sure – you will see more of Piha if you go with Black Sand Tours. 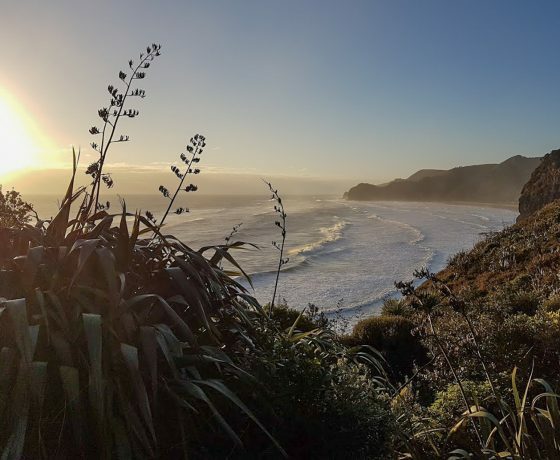 Piha is our backyard. We know the best spots! Whatipu Beach is literally like arriving at Jurrasic park. Minus the dinosaurs. 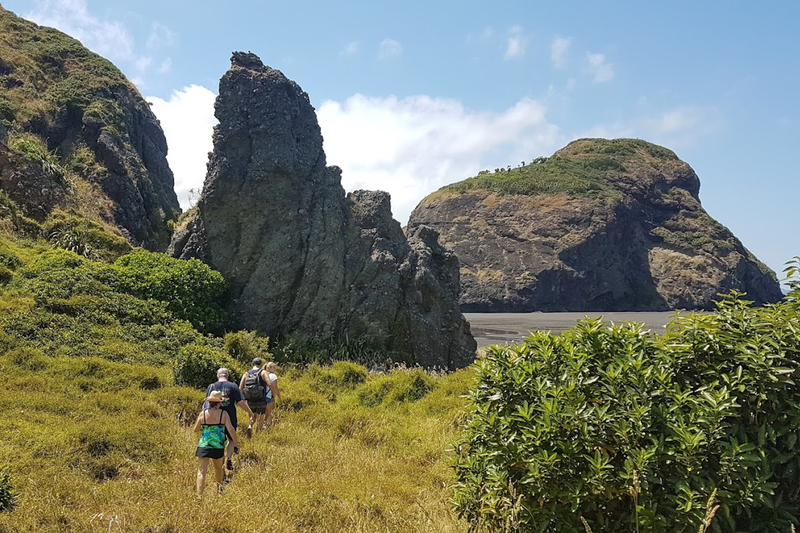 It is a vast, empty, Black Sand beach with amazing dunes, caves, the safest swimming on the West Coast, and a beautiful combination of lush vegetation, harsh grey rock, and the clear turquoise waters of the Tasman sea. Sometimes we find penguins (little Blues) and sometimes seals. Once even a whale and an Orca. 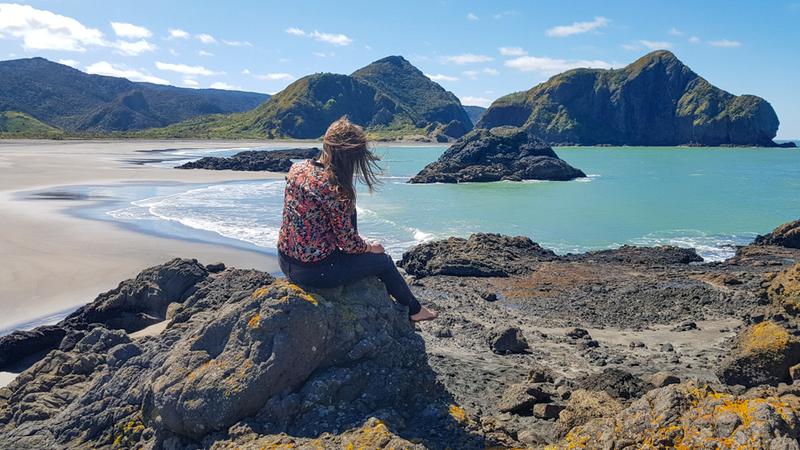 Whatipu really is a spot most tourists never get to. Very few groups operate out here, and it is one of our favorite summer spots. 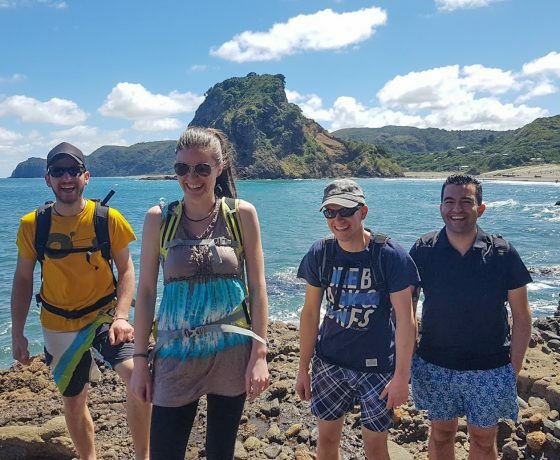 It is a more chilled location, but we can still find some adventure in dune climbs, caving, rock scrambling and snorkeling around the rocks (conditions permitting). 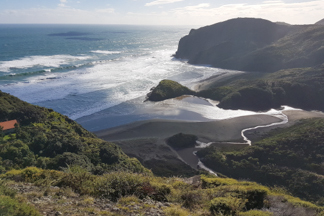 On a windy day, Whatipu can impress you purely with the force of the wind, screaming through the windy cliffs into the Manukau harbour. It’s also a great option to camp for a couple of days at a very low cost. If you want, we can take you out there, show you around, and leave you for a few days, and collect you later, to drop you back to the city. Message us if this is an option for you! Togs. Togs are Kiwi for SWIMMING CLOTHES. 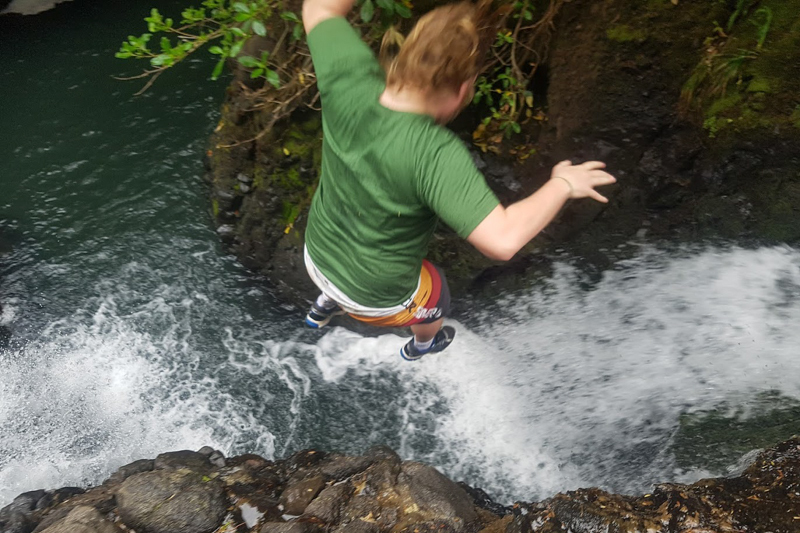 Even if it’s winter and you think you wont swim, you will likely cross rivers, pools, get splashed by surf. Togs are essential for maximum fun on this day. You may not swim, but you will want the option. Jandals – this is Kiwi for FLIPFLOPS or what the Australians bizzarely call ‘Thongs’. Footwear that is easy to take on (when the sand is hot, or we are walking on rocks) or take off (when we wade across rivers, pools, etc). Track shoes can also work. Some people prefer them on rocks. Water – there is no drinkable water in any of the places we go. 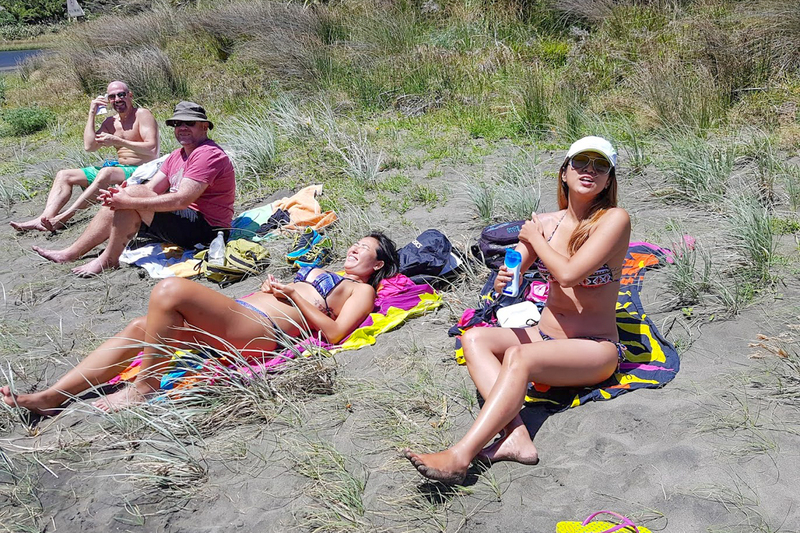 Sunscreen – you can burn in NZ much faster than anywhere else in the world (hole in Ozone Layer) – bring sunscreen. A raincoat. NZ has 4 seasons in one day. Even if the sky is blue – bring a raincoat. It will protect you from the wind. Camera – especially waterproof cameras are awesome. If your camera isn’t waterproof, don’t panic – we will be taking lots of pics of the day and they are free! Nearly every other tour in this region is a bus tour full of people wearing Jeans and a T-shirt. Stopping to take a photo of a location, and then moving on. We want people to feel like locals enjoying the beauty. 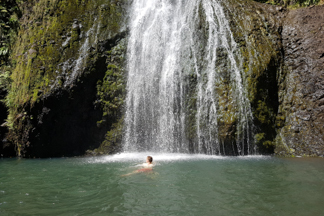 Our customers spend most of their day in togs, leaping into the water, swimming under the waterfalls, wading through the pools in the caves, exploring the little lagoons on the West Coast. Everyone goes home sandy, wet, tired and happy. I don’t think we have ever had a bad review of the experience, and some of the reviews are amazing – people really love the experience. 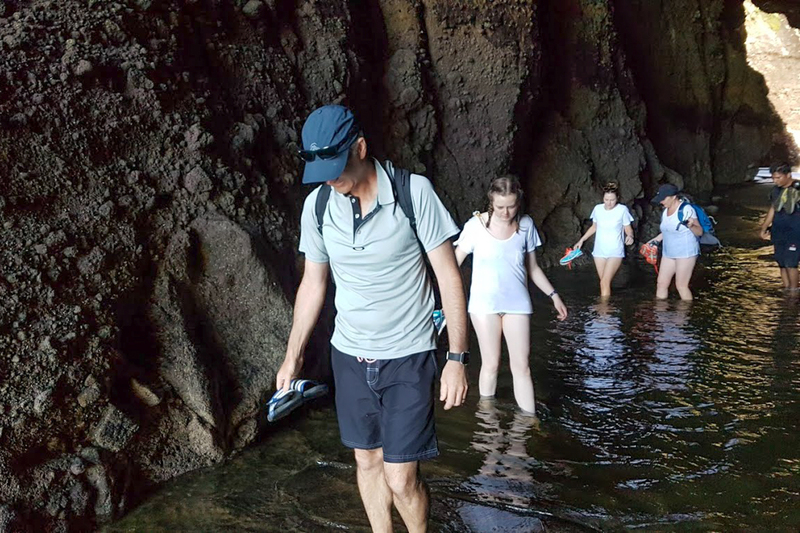 Plus, I think the quality of our free photos on the day really takes us to the next level – people get a full photo record of their trip, diving off rocks, swimming in the sea, climbing over boulders, etc… It’s all captured, and is a part of the day. 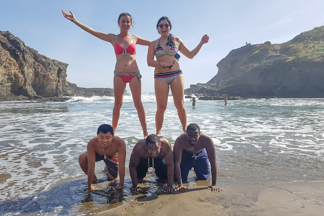 Book your Black Sands Tour today – You’ll Love It ! !